Denise Stephens. Photo by Bradley Slade. 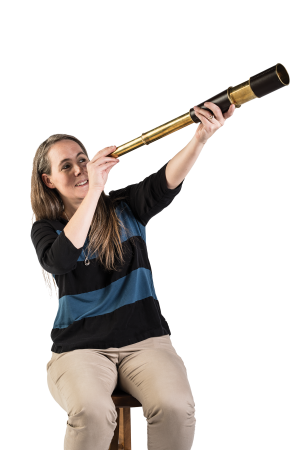 Patiently plotting data collected through a telescope lens pointed at the night sky, a group of BYU astronomers noticed a slight dip in a star’s light a few hundred light years away. That shift in intensity was later confirmed to be from a massive, sizzling-hot planet now named KELT-9b. After many more hours of observation, Denise Nuttall Stephens (BS ’96), associate professor of physics and astronomy, and a intercollegiate collaboration of astronomers have published the discovery in Nature. It’s an exoplanet (any planet in orbit around a star other than our Sun) and is called a hot Jupiter because it is a gas giant like Jupiter with a high temperature. What makes this planet special is that it’s the hottest known exoplanet. At nearly 8,000 degrees Fahrenheit, its atmosphere is hotter than the surface temperature of the majority of stars in the galaxy. And it’s close to its star, completing one orbit in 1.48 days. The Earth, of course, takes a year to orbit the sun. How did KELT-9b get so close to its star? We know that planets can’t form as close as this one is to its star. The forming star is so hot, and there’s no solid material to make a planet in that area. So it had to have migrated its way in—perhaps a close encounter with another giant planet caused it to lose energy. How do you discover a planet? We discover planets by observing the light of stars. A drop in the star’s light might correspond to a planet eclipsing the star. With KELT-9b, we saw about a 1-percent drop in light, which would correspond to a large, Jupiter-like planet. An Earth-like planet would be 1/1,000 of a percentage drop in light, something really tiny compared to this. The drop in light corresponds to the radius of the planet compared to the radius of the star. Will we ever see Earth-like planets? Right now we don’t have the telescopes to see an Earth-like planet or its atmosphere. I think the technology is still maybe 20 years out, probably the next generation after the James Webb Space Telescope that’s going to launch in 2018. Families of faith—Christian, Jewish, and Muslim—actually share the same core benefits. Why do dietary recommendations keep changing? We ask an expert. Create a fearless mindset with these tips from BYU mental strength coach Craig Manning.